Together with 109 other comapnies, organisations and (local) authorities we commit to increasing the biodiversity on our company terrains in the coming three years. 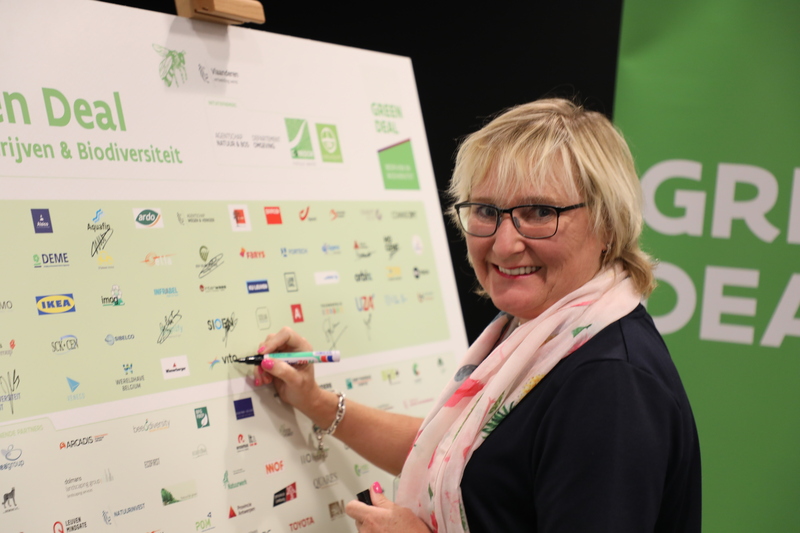 On September 20, 2018 we signed the Green Deal Companies and Biodiversity together with 109 other companies, organisations and (local) authorities. For this green deal we commit to increasing the biodiversity on our company terrains in the coming three years. At VITO we do this with the OnePlanet@VITO project Nature@VITO. With OnePlanet@VITO VITO commits itself to becoming a more sustainable organisation. Nature@VITO fits in that same vision. Signing the Green Deal Companies and Biodiversity underlines our engagement. With the Green Deal Companies and Biodiversity the Flemish 'Departement Omgeving', the 'Agentschap voor Natuur en Bos', 'Natuurpunt' and the study bureau Corridor aim to establish 1.250 hectares of company terrains as permanent or temporary nature. VITO's contribution adds up to 54 hectares company terrain. Read more on the Green Deal Companies and Biodiversity (site in Dutch).